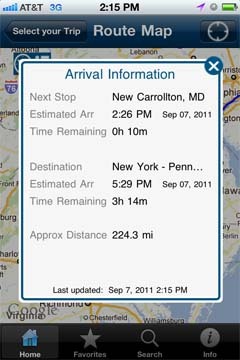 The Find Your Trip screen is used to search for train routes and track a current trip progress. 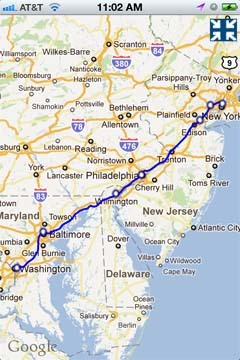 The routes will be displayed graphically. Enter the From and To train stations, and date/time. Enter information by tapping the input field. 1. "From" Enter the station you plan to depart from. 2. "To" Enter the station you plan to arrive at. 3. "Departing Time" or "Arriving Time" Enter the date and time to begin your search at. 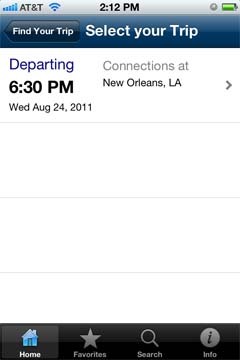 To switch between "Departing Time" or "Arriving Time" tap for the desired option. After the Go! 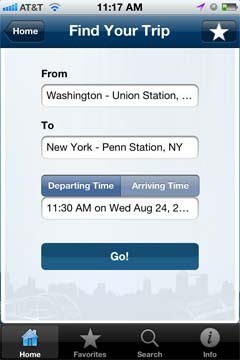 button is tap the Select Your Trip screen will be displayed with train routes that match the search criteria. Use the wheel control to select your desired date and time. 1. "Cancel" Cancel the date/time operation. 2. "Done" Fill the date/time field with the selected date/time. The Select Your Trip result screen displays the results from your search. This includes the departure time, departure date, and connections. The Detail icon is used to transfer control to the Route Map screen. The Route Map screen graphically displays the route you have selected. iPhone Location Services must be turned on to use the following functionality. 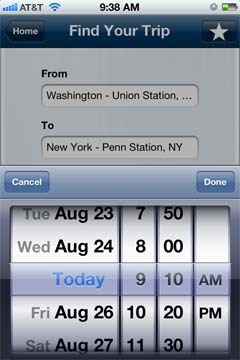 The Location Icon is used to display the current location of your train. Your current location will be mark by a blue circle. . The Route Detail Icon is used to display the detail information for your trip. 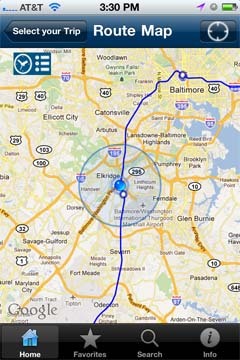 Tap the icon to display the Route Map Detail PopUp screen. The Enter Full Screen Icon is used to switch your Route Map display to full screen mode. By adjusting the iPhone the display can be horizontal or vertical. The Route Map Location screen graphically displays the route you have selected and your current location. iPhone Location Services must be turned on to access the Route Map Location screen. The Route Map Full Screen graphically displays the route in full screen mode. By adjusting the iPhone the display can be changed from vertical to horizontal. The Exit Full Screen Icon is used to exit full screen mode. 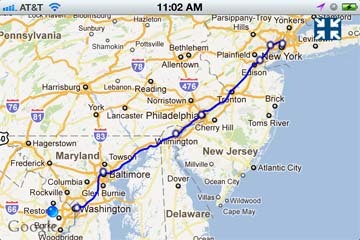 The Route Map Full Screen graphically displays the route in full screen mode. By adjusting the iPhone the display can be changed from horizontal to vertical. The Route Map Detail PopUp screen displays the detail information about your trip. This includes Next Stop, Next Stop Estimated Arrival, Next Stop Time Remaining, Destination, Destination Estimated Arrival, Destination Time Remaining, Approximate Distance, and the last time the information was updated. 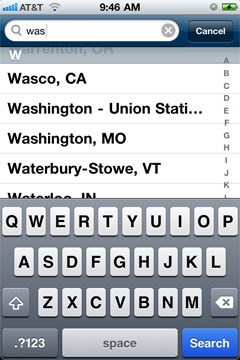 iPhone Location Services must be turned on to access the Route Map Detail PopUp. Closes the Route Map Detail PopUp screen.